Directions Exchange Information: One (1) drop = free exchange. Ten (10) drops = 1 fruit. 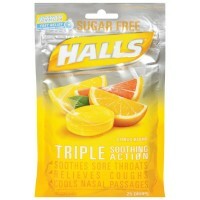 Uses Halls Defense Sugar Free Vitamin C Supplement Drops help keep you going by helping to support your immune system. 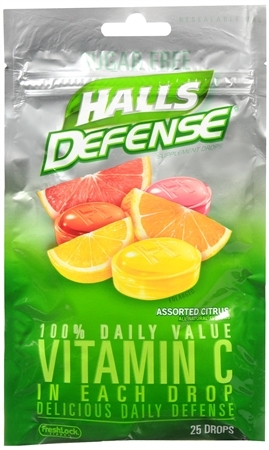 * Every delicious, fruit-flavored drop delivers 100% of the Daily Value of Vitamin C. Assorted Citrus Halls Defense Sugar Free Vitamin C Supplement Drops are available in the following natural flavors: lemon, sweet grapefruit and orange. Assortment in each package may vary. *This statement has not been evaluated by the Food and Drug Administration. This product is not intended to diagnose, treat, cure or prevent any disease. Warnings PHENYLKETONURICS: CONTAINS PHENYLALANINE. EXCESS CONSUMPTION MAY HAVE A LAXATIVE EFFECT.